Vaido (Võrumaa, Estonia) on 29 January 2016 in Landscape & Rural. 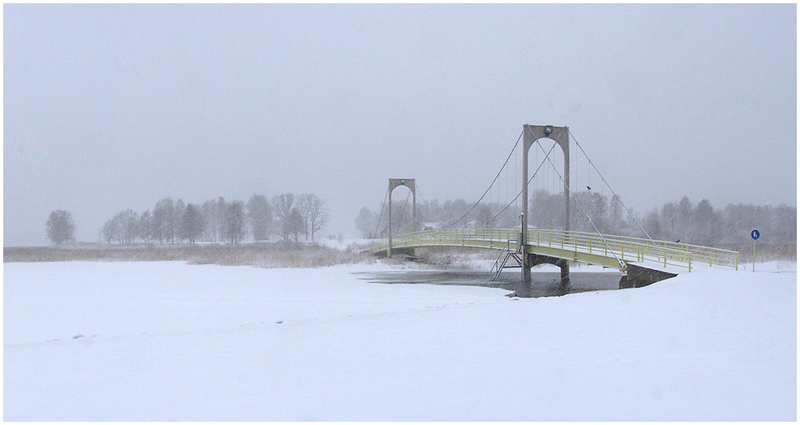 This is the bridge connecting my hometown Võru with peninsula called Roosisaar (Rose Island) since 1998. It's a longest suspension bridge in Estonia (180 m). The photo of the old bridge here was in yesterday's post. Võru linna ühendab nüüd Roosisaare poolsaarega 1998. aastal valminud rippsild, mis hetkel kõige pikem Eestis (180 m). Vanast sillast oli pilt eilses postituses. love the cold haze that permeates this image! Definitely very different to the previous bridge! I like the high key effect of the haze in this scene. A sturdy and pretty bridge, too. A good replacement for the old one.